Is the jury in — or out? It looks like the low-rated You the Jury TV show may soon be cancelled by FOX. After just two episodes aired, FOX replaced last Friday’s episode with a random re-run of Lethal Weapon. That move seems to indicate the verdict is not good. You the Jury is a legal reality series hosted by Judge Jeanine Pirro. Attorneys Charla Aldous, Jose Baez, Mike Cavalluzzi, Benjamin L. Crump, Areva Martin, and Joe Tacopina argue cases before former California Superior Court Judge LaDoris Cordell. Afterwards, the audience gets about five minutes to vote via text and the FOX Now App. At the conclusion of the Eastern/Central time zone broadcast, “America’s Verdict” is revealed. The vote is 100% live and binding. However, it’s not always permanent. After the Mountain and Pacific zones vote, if the cumulative total leads to a different result, the original verdict is overturned. 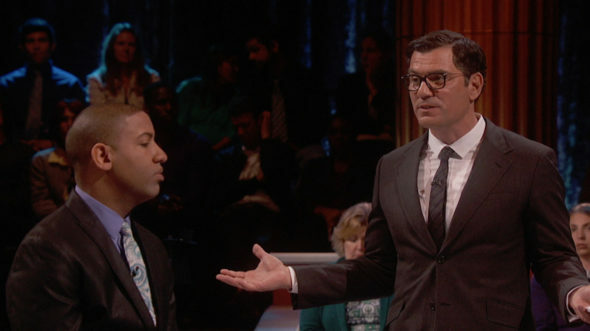 The first season of You the Jury is averaging a mere 0.34 rating in the 18-49 demographic and only 1.37 million viewers. While, by default, one show has to be the lowest-rated on each network, You the Jury is tanking in both the demo and in terms of total audience size, compared to other FOX TV shows. As of right now, You the Jury, episode 1.03, “Alienation of Affection,” is still on the FOX schedule for Friday, April 28th at 9:00pm, following the season two finale of the also low-rated Rosewood. We’ll keep an eye on the schedule this week, and update you, if that changes. What do you think? Have you been watching this new FOX TV series? How do you like it, so far? Should the You the Jury TV show be cancelled or renewed for season two on FOX? Let us know, below. You the Jury: Is the FOX TV Show Cancelled or Renewed for Season Two? I loved this show but once again FOX screwed up. First, they took off Judge Alex which I loved and so did many others now they take this off. I love Lethal Weapon but I want to see more episodes of “you the jury”. Joe did such a good job on episode 1 I waited for episode 2. After that, it disappeared. Come on. Give this a chance. I was beginning to look forward to You The Jury, and then it was gone. What happened? I truly hope that you consider bringing it back to FOX. It’s certainly a lot better than most shows on TV. Please bring the show back. Thank you. I think You the Jury is amazing and should stay on the air!! It fit in perfect with todays issues….